Can you tell i've been trying new things with wire?? I guess you can say i've gone wire wrapped crazy! 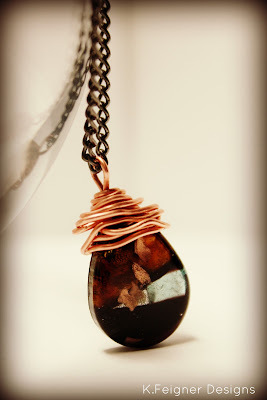 I bought some glass pendants at Walmart that were on sale and wrapped some copper wire around the top of one of them and voila! You have a much cuter pendant to put on your chain necklace! I think that the copper wire brings out the copper in the glass. And all I used was some pliers, copper wire, and a pendant.